Socks and Puppets, the comic » 466 – Why did they call a red berry a ‘strawberry’ anyway? 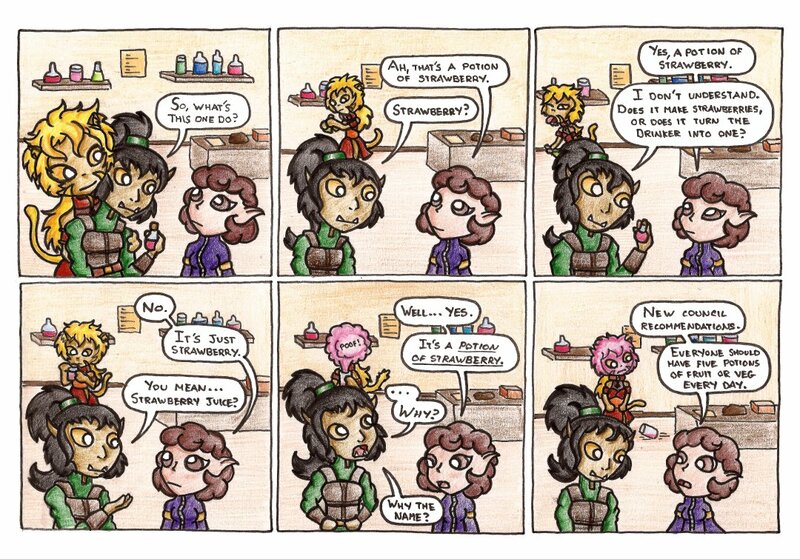 466 – Why did they call a red berry a ‘strawberry’ anyway? I’m still no good at drawing backgrounds in comics, but I figure I can at least draw characters at half detail back there, and stick a bit of slapstick into the background. Strawberries are a low creeping sort of plant with heavy fruit, you traditionally cover the ground around them with straw so that the fruit isn’t spoiled by resting on the floor. I’m just going to imagine that Gooseberries are named such for the same reasons now.